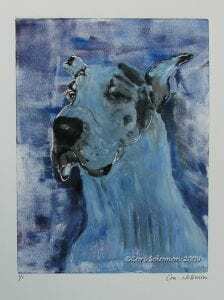 This Monotype of a Great Dane utilizes the color blue to create a magestic feeling of this large breed of dog. One feels the strength and power of this Great Dane in this Hand Pulled Print. This Great Dane Monotype won third place in the Hand Pulled Print category in 2010 at The Art Show At The Dog Show. To purchase this Monotype email Cori.